It might feel intimidating to market your small business against larger corporations with seemingly endless marketing and advertising budgets, but you don’t have to break the bank to improve your rankings in a Google search. Did you know the ads you see only generate approximately 30 percent of clicks? The other 70 percent of clicks come from the top ten search results. Don’t spend exorbitant amounts of money to appeal to 30 percent of Google users only. You can improve your SEO and boost your search rankings by taking a few simple steps. The best part, everything is free! With the right tools and enough bandwidth, you can compete in the search rankings with the top ten results. Here are three tips for boosting your SEO without spending a dime. Round-up posts are a culmination of expert and influencer opinions on a specific topic or question formatted into a blog post. When preparing your round-up post, decide on a topic or question reflective of your industry or desired organic search, then research the top people associated with this question. Pull together a list of influencers you want to contact, including extras to ensure you have enough content if some people do not respond, and reach out to these industry experts with your question. Most people are very willing to help a fellow industry specialist and even more willing to share their opinion. Take the responses you receive, and pull these into your blog post. Be sure to include the name and the picture of each respondent. After posting your round-up blog, reach back out to your influencers and ask them to share your post. Again, most people are incredibly affable and willing to share. It’s free press for them! And it’s a great way to spread the word about your brand. Think of it as a form of networking that will increase your social media presence through influencer shares. The more shares, the more likes and follows you will get! The websites in the top ten search results are doing something right. If you want an inside peek into exactly what that is, you can use this free Keyword Density Analyzer tool from SEObook. Please note: You have to register for a free account in order to access the tool due to recent changes by the SEObook. To figure out who your competitors are, do a Google search for your industry, product, or topic to reveal the top search results. Next, you can copy and paste your competitors URLs, one at a time, into the Keyword Density Analyzer tool. The tool will then crawl through the given URL and pull out the keywords and list these in order of usage. This gives you an inside look into the keywords people are searching which then lead the users to your competitor’s website. You can pull the top keyword results and integrate these into your own website’s content. The key to doing this successfully, however, is not to keyword stuff your content, but to be thorough and comprehensive across your website. To stand out from the competition, be more in-depth in your content. Google likes to rank websites higher when the material is fully fleshed out and provides the most value to the user by providing all relevant information in one place. So, after using the Keyword Density Analyzer tool, take the keywords driving traffic to other websites and scatter these through your content while providing your users with quality and useful information. It’s not a quick-fix, but over time you will notice your search rankings climbing past competitor sites because your website provides quality information rather than shallow keyword stuffed overviews. A great example of a website that does this well is Wikipedia. While it may have started out as a data dump for the layman to share knowledge, Wikipedia has grown into a well-cultivated repository of thoroughly researched of information, which relies on keywords to attract users, but keeps users by providing them with material relevant to their need. Another example is our The Fortress of Amberd article. Here we explain the origin of our name with an in-depth history lesson on the design of the Fortress of Amberd. This article provides the user with a wealth of knowledge while also integrating the desired keywords into the information. Even Wikipedia links to this page as an extra information for its users. And a link from Wikipedia is a big deal! If you create and post expansive content hitting on all areas of your industry, you will attract more users and increase your search rankings more than you’re competitors relying on back links and social shares, because you are providing users with genuinely useful information that keeps them on your site longer. Because you aren’t paying for ads, users have to find your website through organic search. Use the words you want to be your primary organic search keywords to perform a Google search. Upon receiving the results, pay attention to the titles for the ads at the top of the page. Rankings for ads are based on money spent (also known as cost per click) and ad appeal. The ads at the top of the results are going to have higher appeal, which is why Google has ranked them at the top of the results. You can do the same with your title phrasing and meta tags. 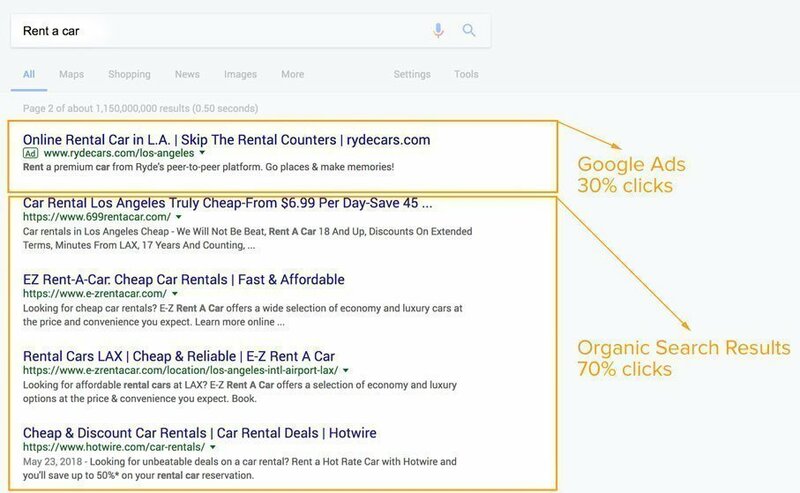 Using the keywords and formatting of the high ranking ads, you can imitate this copy to create appealing and effective copy for your title and meta descriptions. Google determines your rankings based on clicks, and appealing content is what drives those clicks. Now that you know how to boost your SEO rankings without spending an overwhelming amount of money, take the time to put these steps into practice and watch as your website climbs the ranks of the Google’s search results.